Jody, in reorganizing what we affectionately refer to as our “crap room,” just yesterday found a packet of letters from her Grandfather to his future bride Dolores during his service as part of the Army Air Forces in WWII. Jody and her Mother, Bonnie, thought these letters missing. Searches on both ends occurred without success. 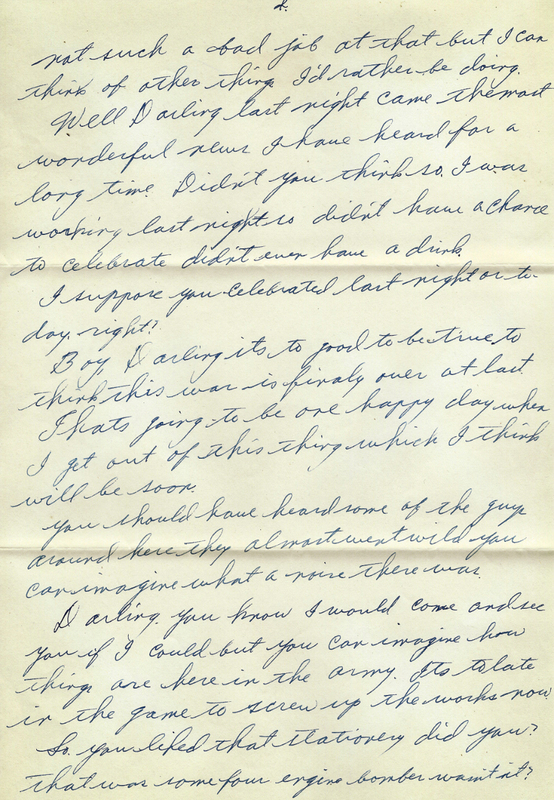 In these particular letters we were able to hear of the end of the war through Jody’s Grandfather’s eyewitness words. And oddly enough, these words turned up this particular week. The Ending of the War, almost an Afterthought! A strange coincidence? Yes. This week marks the passing of an indelible date to people on both sides of the Pacific: the anniversary of the surrender of Imperial Japan. On August 15th, 1945, Japanese Emperor Hirohito formally announced his government’s surrender, and in the process, effectively ended World War II. 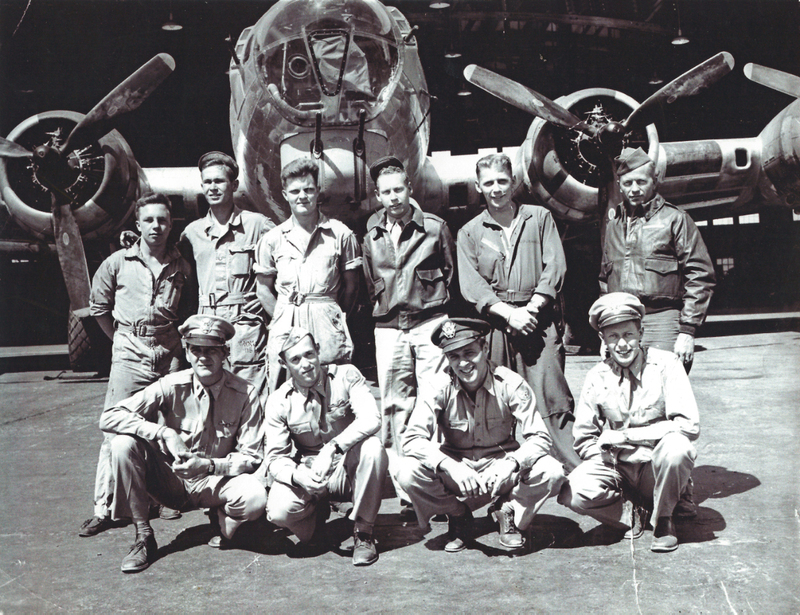 B-17 Flying Fortress crew of 10. Donald Larson is standing all the way to the right. He was already an old man being already in his 30s. 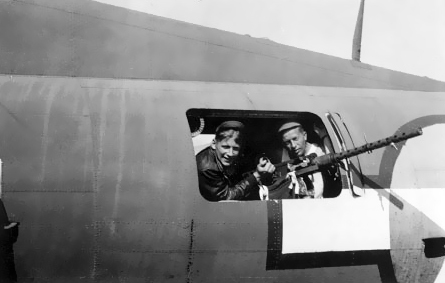 At the time, Jody’s Grandfather, TSgt Donald Edgar Larson, was stationed in Wisconsin, having previously survived 35 bombing missions as a B-17 Flying Fortress mechanic and aerial gunner. 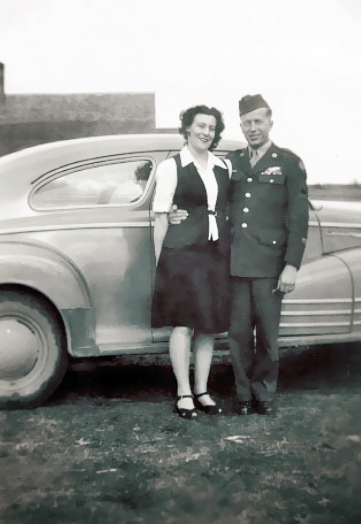 From the summer of 1944 through early winter of 1945, Don fought the war in Europe as part of the Eight Air Force in the skies over Germany and France. 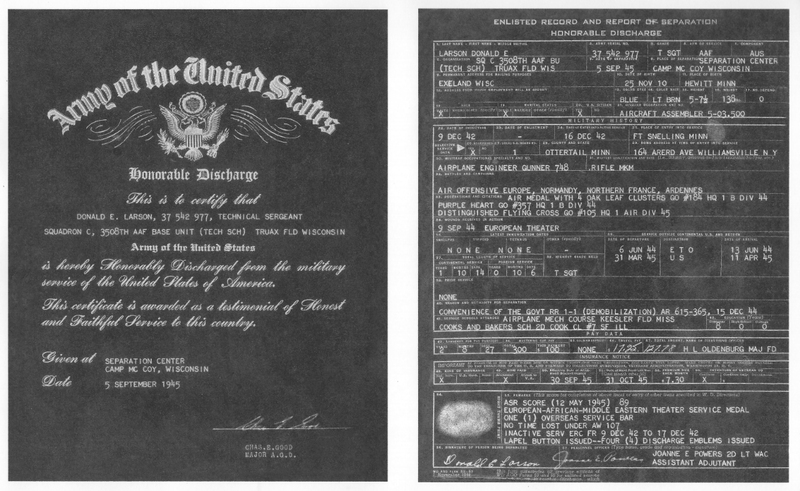 In a somewhat less glamorous yet infinitely safer role, at the time of the Japanese surrender, he found himself driving trucks at the Army Air Force’s Truax Field, just outside of Madison, Wisconsin. His love, Dolores, was in Iowa. Truax Field was activated as an Army Air Forces airfield in June 1942, and served as the headquarters for the Army Air Forces Eastern Technical Training Center, tasked with training B-17 mechanics and radio operators, and in later times, radar operators for the “new” B-29 Superfortress. Today, it is an Air National Guard Base, co-located with Dane County Regional Airport, home of the Wisconsin ANG 115th Fighter Wing, equipped with the F-16 Fighting Falcon. In another odd connection and “what are the odds” turn of events (see Long Odds and Unlikely Connections for more), this past spring I ended up befriending and training in scuba a number of reservists from this very base and unit while they were deployed to Kadena Air Base here on Okinawa, Japan. At noon on August 6th, 1945, Gyokuon-hōsō (玉音放送 “Jewel Voice Broadcast”) was heard in a radio broadcast in which Japanese Emperor Hirohito read out the “Imperial Rescript on the Termination of the War” (大東亜戦争終結ノ詔書 Daitōa-sensō-shūketsu-no-shōsho). It was translated into English and simulcast throughout the Pacific and in America. In what was probably the first time that an Emperor of Japan had spoken to the common people, he announced that the Japanese Government had accepted the Potsdam Declaration demanding the unconditional surrender of the Japanese military. The bloody Battle of Okinawa, the twin devastating atomic bombings of Hiroshima and Nagasaki, and the Soviet invasion of Japanese-held territories all conspired to bring the War in the Pacific to a quick and somewhat unexpected end. The date was known to the allies of the time as “Victory over Japan Day (V-J Day),” and remains so for the United Kingdom. However, official commemorations in the United States honoring the ending of World War II occur on September 2nd, when the formal signing of the surrender document on the battleship USS Missouri in Tokyo Bay actually transpired. In Japan, August 15 usually is known as the “Memorial Day for the End of the War” (終戦記念日 Shūsen-kinenbi). The official name for the day, however, is the “Day for Mourning of War Dead and Praying for Peace” (戦没者を追悼し平和を祈念する日 Senbotsusha o tsuitōshi heiwa o kinensuru hi), nomenclature fairly recently adopted by the Japanese government in 1982. 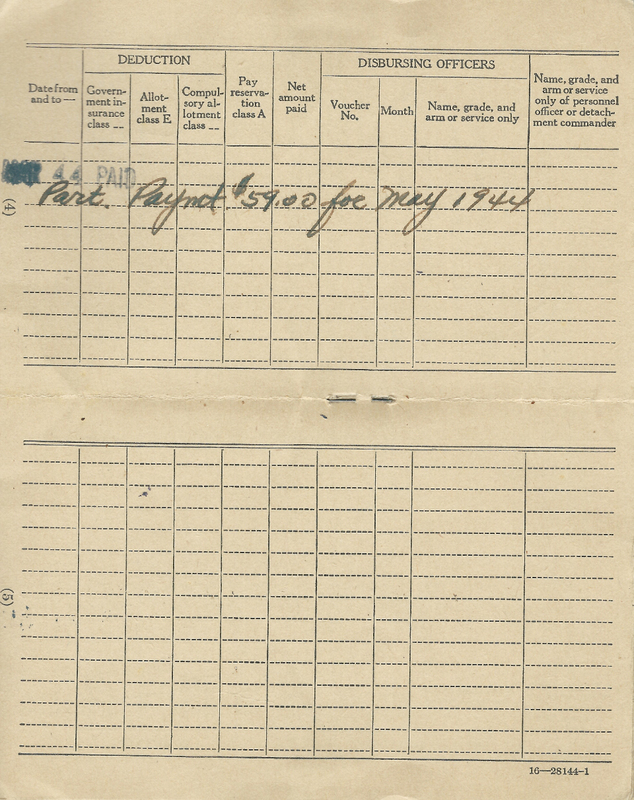 Postage was only 3 cents, but look at military pay of the time! 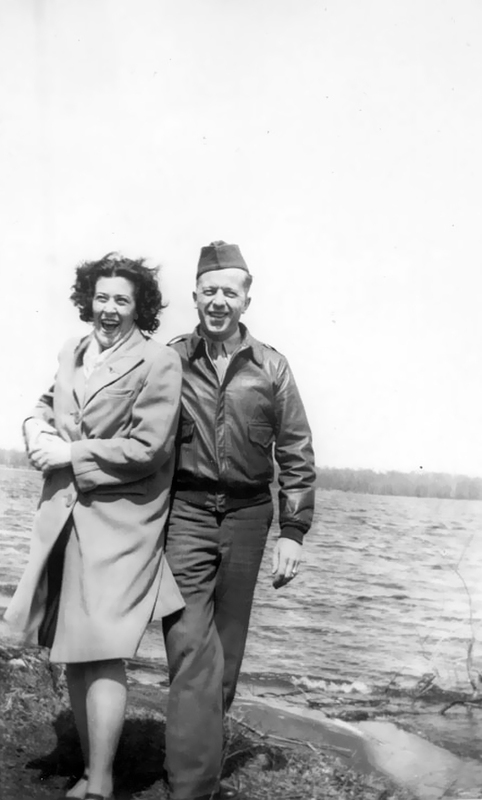 The end of the war, a momentous occasion by any standard, is oddly almost an afterthought in Don’s letters to his girlfriend. 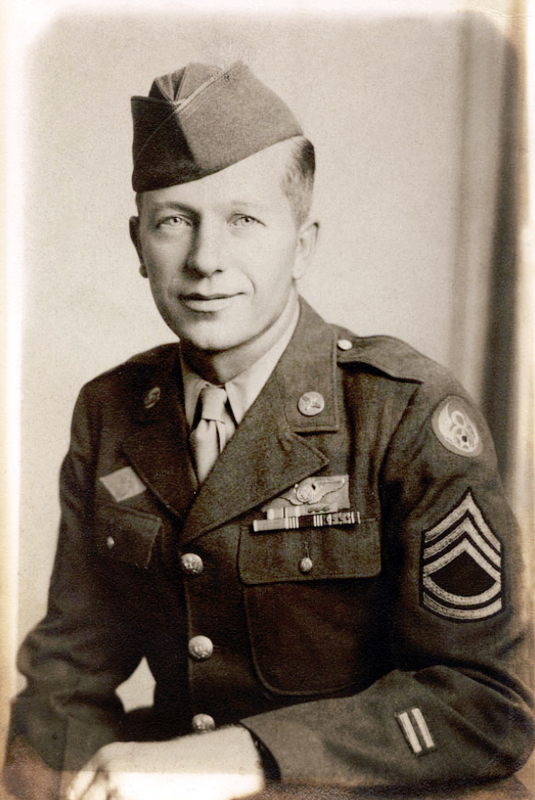 Perhaps he knew that his combat days were over in that war, having survived the Luftwaffe and the 8th Army Air Force. 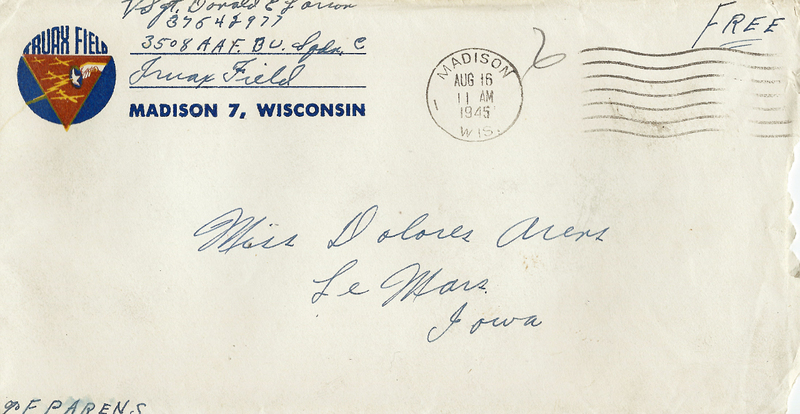 Equally as interesting, the envelopes used to send his letters were addressed merely to just “Miss Dolores Arens, Le Mars, Iowa,” while the postage was free (but 3 cents for the general public). The postmarks are all from Madison, WI, and dated 1945. Such a simpler time on most fronts. Except for that horrible, global war…. Hello my Darling how are you any way (sic)? 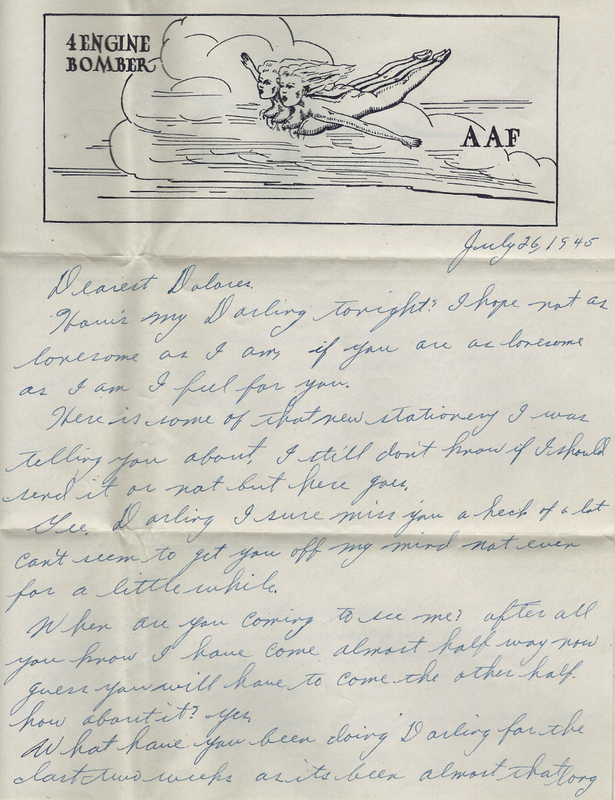 I had begin (sic) to wonder if you was still living or not as it had been so long since I had heard from you from the 1st until the 15th that’s a long time between letters. I planned on waiting until I got an answer but same as usual I didn’t. 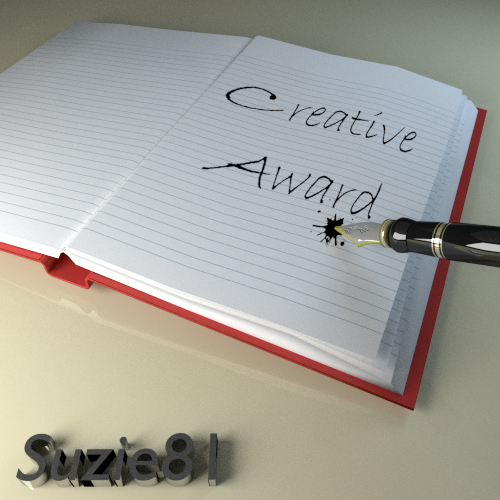 I should wait as long as you did before I write but some thing (sic) won’t let me. Darling I just got your letter yesterday saying that you got the watch O.K. it went to Chanute and they was how about sending it on to me. Oh! Yes how’s the sun burn you mentioned in that letter? Hope its O.K. Yes, Darling I am still driving trucks not such a bad job at that but I can think of other things I’d rather be doing. Well Darling last night came the most wonderful news I have heard for a long time. Did you think so? I was working last night so didn’t have a chance to celebrate didn’t even have a drink. I suppose you celebrated last night or today, right? Boy, Darling its to (sic) good to be true to think this was is finaly (sic) over at last. That’s going to be one happy day when I get of this thing which I think will be soon. You should have heard some of the guys around here they almost went wild you can imagine what a noise there was. Darling, you know I would come and see you if I could but you can imagine how things are here in the army. Its to (sic) late in the game to screw up the works now. So you liked that stationery did you? That was some four engine bomber wasn’t it? I couldn’t say if it was a B-29 or what it was, Ha! It was a new model of some kind. I got Romies (sic) address too I’ll write to him not saying that it will do any good, but if he isn’t getting your letters it seems as tho (sic), you would get them back. Well My Darling think I have wrote (sic) enough for this time and guess I’ll wait until I get an answer before I write again. Should I? Good night My Darling see you in my Dreams. Thankfully, Don and Dolores’ relationship survived both that world war and some rather risqué stationery (for the time). The emergence of this correspondence during this week of historical significance provides a beautifully clocked look back through time, and into the roots of our families. And one that offers an overlay of everyday humanity that sometimes we forget always permeates even the most auspicious of occasions. 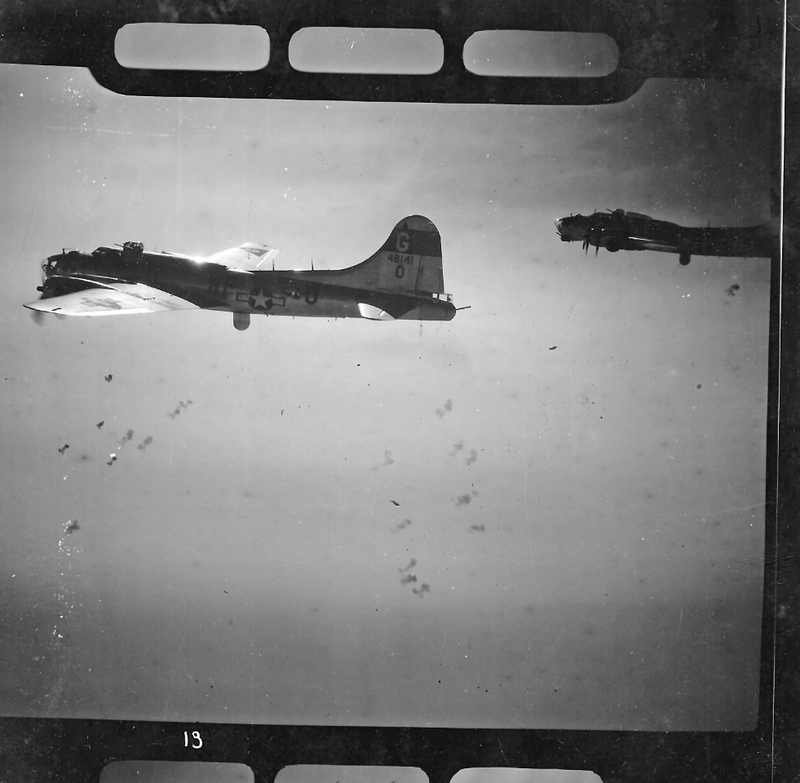 This entry was posted in Family & Friends, Okinawa Living, Traces of War, US Military & Okinawa and tagged Army Air Forces, B-17, B-17 Flying Fortress, family, Flying Fortress, japan, Okinawa, Surrender of Japan, Traces of War, V-J Day, Veteran, Victory, Victory over Japan, VJ Day, World War II, world war two, WWII. Bookmark the permalink. Primary documents! A history buff’s dream. Yes, you should see what we have. 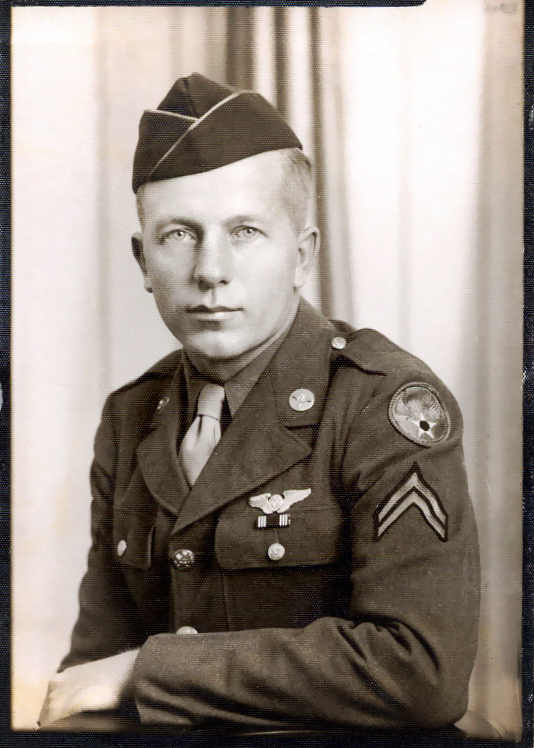 Jody’s Grandfather did 35 combat missions in a B-17 over Germany and France, and he detailed each one. Another blog will be coming shortly featuring him and my Uncle Colonel Robert M. Stowers, USMC, (Ret.). Stay tuned!